When pulling these Freeriders out of their packaging, they don’t look not much different than regular shoes someone would wear down the street, through the hall, or at the mall. However, once you throw them over a thin plate of metal with spikes pointing up, they quickly separate themselves from the basic “skate” shoe. It’s this fundamental concept that I feel has made them so popular. Aside from the looks, the weight of these shoes is that similar to skate shoes as well. Coming in at 931 grams for size 12US, they aren’t too heavy, even for those looking for high performance gear. As mentioned above, what makes the Freerider so great is the classic rubber outsole. Five Ten calls it their Stealth S1™ rubber and has really built a solid reputation for the company. The S1 rubber offers a perfect balance of grip and durability that will satisfy the majority of riders out on the mountain. Even after months of riding, the outsoles show very little signs of wear. Compared to their Mi6 (their grippiest) compound which showed indentations where the pins bit through the first portion of the outsole. The mesh sections of the upper shoe offer excellent ventilation for the hottest of summer rides. As expected with this mesh however is the lack of waterproofing. When wearing the Freeriders, beware of cross streams which will completely saturate your shoes if you aren’t careful. The Freeride shoe comes with a pretty basic insole which offers good support but nothing out of this world. If stability is #1 on your list, I would look at an aftermarket insole or possibly spending $50 more and going with the Freerider Pro which has a slightly more advance insole. The S1 outsole of the Freerider offers the best grip to durability ratio out of all the Five Ten compounds. It’s because of this that the outsole of the Freerider will last a long time. The rest of the shoe offers decent durability but isn’t absolutely indestructible. The suede and mesh material is subject to ripping if snagged right and the stitching holding the outsole together can become frayed. There is one thing that I find to be a huge key for finding the most durable shoe and that is a solid inside wall to a shoe. This may not be important in other sports but where you are constantly pedaling to keep moving, the inside wall of riding shoes is right flush with the crank arms of the bike. Taking a look at the Freeriders after my testing period, I could see some wear and tear markings on them. This wasn’t as bad as some shoes I’ve seen but it certainly wasn’t the most durable inner wall I’ve had either. Although the Freeriders offer decent durability, if you are looking for the ultimate durable shoe, spend an extra $50 and get yourself the Freerider Pros. The Freeriders aren’t Five Ten’s most popular shoe for no reason. They offer a casual profile, excellent grip, and great ventilation. They are the type of shoe you can wear to work and then hope on your bike without having to think twice about swapping them out. They offer decent durability and for the price, are hard to beat. If you are looking to ultimate durability, I would suggest looking into the Freerider Pros which have a similar design but upgrades components. But, for the price of $100 (which you should be able to find on sale as well), you really can’t go wrong with the Freeriders. After many years of riding clipless, I have been riding flat pedals again. About six months of dabbling later, I decided to upgrade my shoes to something newer. The Five Ten Freerider is the industry standard for the function so I picked up a pair for $80 direct from the Adidas website. The design and construction looks really good. My feet are narrow so my only complaint is the toe box seems quite large. The shoes are only three rides old at this time so that fit may change as they further break in. This extra space could also be a good thing if I want to wear thicker socks. One weird details is the extra long shoe laces. Not sure if I am missing some special way to tie them or if I just need to cut them shorter, but they are way-y-y-y long. As expected the stealth rubber sticks like a spoonful of honey has been added to each sole. I have regular height pins and they do not seem to be causing that eventual damage to the soles yet either. I went with standard Freerider model because of the ventilation and happy with that aspect. I have seen complaints about the longevity of the design since Adidas took over so we will see how well they wear. Really good riding experience so far (sticky and stable) and I am learning new ways to ride (without pulling upon the pedals). If Sam Hill can have that much fun riding up and down on flats, I can surely have half as much fun riding much, much slower on flats! So far, so good. I recently became an IMBA certified bike instructor, and for the course you had to ride flat pedals. Picked up a pair of freeriders, and have never looked back. These shoes offer a semi stiff sole which aids in pedal feel and grip, but aren't so stiff that walking around is awkward and uncomfortable. Although I have noticed that for longer hikes they can be a touch stiff. I have the freeriders with the standard black sole, and they offer legendary grip, but I can still shift my foot without too much issue. It did take a bit of getting used to as I do have to lift my foot a bit at times if I am cemented to the pedal. These shoes are my go to when practicing new skills with flat pedals, as well as a durable and comfortable shoe I wear almost everyday. I went through a set of vans every couple of months, but thus far these have held up great and should last significantly longer. I was a bit leary of the suede outers, but threw some waterproofing spray on them and haven’t had issues. Overall a great option for those that want a shoe that can handle DH trails to trail riding to hitting the town. Don’t let the price scare you off from having a solid pair of shoes that if taken care of should last a good while. The only MTB shoe I will buy from now on! The 5.10freeridershoe is my second 5.10 shoe that I bought. The first one was the sam hill high top used for DH and now that I ride trail mostly, I needed a new shoe that was lighter and more breathable but still had the grip I came to love with my DH shoes. It was great that I didn't even have to shop around much for different shoes. I know the quality that is brought to the table with 5.10 and that my money will be well spent on them, no matter what the initial cost is. I looked at the shimano and the specialized shoes too but for the price, I didn't want to take a risk knowing that there was a solid winner right there for the taking. The 5.10freerider shoe is my second 5.10 shoe that I bought. The first one was the sam hill high top used for DH and now that I ride trail mostly, I needed a new shoe that was lighter and more breathable but still had the grip I came to love with my DH shoes. It was great that I didn't even have to shop around much for different shoes. I know the quality that is brought to the table with 5.10 and that my money will be well spent on them, no matter what the initial cost is. I looked at the shimano and the specialized shoes too but for the price, I didn't want to take a risk knowing that there was a solid winner right there for the taking. The fit is comfy and stiff at the same time so it gives you better grip on the pedals. The flat pedal sole is still in great shape and hasn't worn that much at all in the 2 years that I have owned them. If anything, it just became a bit easier to move my foot around on the pedals while riding, which is not a bad thing. The ONLY complaint I have is that the laces were wayy to long when I first got them, even tying them in a triple knot didn't shorten them up enough. Being the cheapskate that I am, I cut the laces and tied them back together again and put them back in my shoe instead of getting new ones and they have worked perfectly ever since. These aren't waterproof but I'm sure you can spray them with some of the water replant and get them pretty close to a waterproof shoe. Buy these shoes and don't look back! I wanted a shoe that I could wear while out trail riding because I was tired of using my stiff impacts for downhill and trail riding. I started a paper route and saved up my pennies, purchased these bad boys online, not sure where, prob from Amazon or something because they have good return policy. They arrived and viola I am wearing comfortable new shoes. I figured they would be good for mtb but turns out they are good for anything, ya know, go mtb w/ your mates for the day, change out of something less stinky, head to the pub for a pint and a bite to eat type of shoe. My friend white Chris got a pair on my recommendation and he loves his so we got that going for us too. I never had any issues with my feet coming off my flat pedals but after hear great reviews about 5.10 I thought I would give these a try, and after use of them for one season I think it would be hard to go back to anything else besides the 5.10 sticky rubber. There are times where they feel almost too sticky (its like those first times of riding clipped in and you forget to unclip), they stick to the pedals so well and do so in all conditions, wet, snow, mud..etc. When I say too sticky I just mean that sometimes they can be tricky to reposition them when paired with pedals with aggressive pins but nothing that can be handled. I found also if you are hiking with your bike up any rock faces the shoes grip the rock like glue, they are awesome for hike-a-bike type days. Another bonus is when you need to clean these shoes the materials sheds the mud very well. In terms of style the shoes look really nice and can be worn off the bike as well without looking like a goof something that hard to do with the 5.10 impacts. The only negatives a found is that the shoes aren’t as comfy as other skate shoes such as Nikes, so if you are just wearing them all day on the street you may find that they can get a bit uncomfortable. The other issue is that due to the tough material they get a bit hot on really hot days but this is nothing that can’t be dealt with. Overall for riding these issues don’t really cause any concern. I’d consider these a game changer in terms of items you can buy for biking, once you wear a pair of 5.10 shoes it would be very hard to go back to anything else. These shoes are great. They share a similar feel to the original retail impacts. There is a better connection between the rider and the pedal than the current model of impact, while still maintaining great grip and durability. Only bad side is that they take on more water than the current impact, they they offer no where near as much toe protection. Great shoe, and easily should be attributed as the true successor to the original (and the best) impact. I bought these after running a couple pairs of Impacts over 5 years or so. I couldn't get into the thin feeling of these shoes and have relegated them to around town kicks and the odd urban ride. Can't recommend for DH or even trail riding due to the flex. Your mileage may vary. Amazing grip- nothing beats 5.10 stealth rubber for traction. Lighter and more breathable than the 5.10 Impact or Karver. Durability. The sole delaminates too soon. The new model comes with a new sole construction. 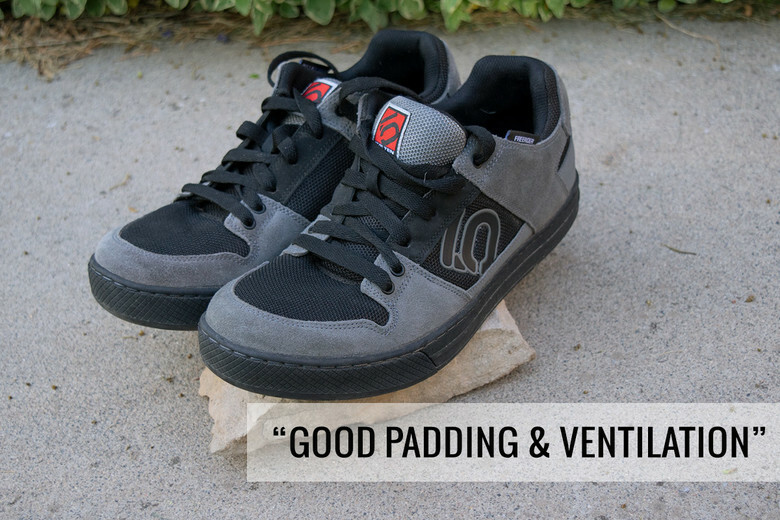 Five Ten makes the best flat pedal shoe on the market. The Freerider is perfect for the guy who wants a casual, more breathable, less bulky, less stiff shoe than the 5.10 Impact. The Freeride / Bike Parkr is Five Ten's most versatile all-mountain flat shoe. Inspired by the comfortability and style of BMX, we equipped the Freeride / Bike Parkr shoes with Stealth® S1™ rubber for added support and thickness; making the Freeride / Bike Parkr your anywhere, anytime, anything shoe.